After returning from Morocco, I kept the ethnic spices flowing, starting with an outing to a Sri Lankan restaurant, Bharath, in the 10th, a few blocks off the Canal St. Martin. I went with a British group since they are experts in Indian food, and yes, I would say those from India might know a thing or two as well. We had some great tikki masala with legitimate spice for super cheap prices. There wasn't much on the menu over 10 euro. I also was happy to find another great spot this week called Mojito et Bob's, a casual tapas place off the trendy Rue Oberkampf in the 11th. We devoured a large plate of fabulously fried zucchini tempura, ham and cheese croquettes, spiced, grilled polenta squares, sardines rillettes and of course some nice cheese. We moved onto a creamy rich risotto with bright peas, tomatoes and asparagus, and then supplemented that vegetarian dish with turkey skewers hidden under heaps of sinfully delicious bacon. We finished with what I'd like to say was like an underdone brownie in a glass. The top was firm, and then dig in, and it's creamy chocolate. Mmmmm. All of this for less than 16 euros a piece! I should mention we brought our own wine, which is a special treat, and not one regularly offered at Parisian restaurants. Corkage was just 5 euro. Read my Girls' Guide review here. 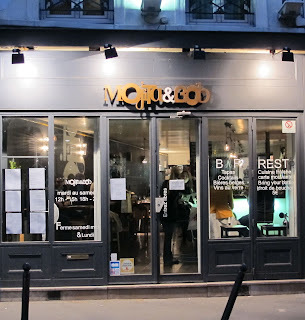 I've also been wanting to try out a spot on the Rue Ste.-Anne, which is not far from the Opera Garnier, and is chuck full of wall to wall Japanese restaurants. How do you decide which one is best? You can judge by the lines outside. Most aren't big places, so people wait outside, and sometimes down and around the corner. The line we stood in for Kunitoraya was the longest, and it's understandable, as they are making some of the best homemade udon noodles around - in France or dare I include Japan as well. What to eat? A big bowl of steaming, salty broth with the fresh, chewy, long noodles. We got shrimp tempura on top as we saw many others doing, which did leave it a bit soggy, so I think next time it will be on the side. We've been enjoying some good live entertainment lately - and not just those by chefs cooking noodles. We stumbled upon Bistro Amelot one night after leaving dinner. We heard good music from the street, so in we went where we found a fabulous band playing Motown. The singer was amazing, transforming himself from Prince to Marvin Gaye, singing in perfect English, and then speaking between songs in perfect French. People were even dancing here, which was quite different than my experience at the Sting concert. We also finally popped into the infamous Harry's Bar. Harry's is over 100 years old. A guy owned a bar in New York and a friend asked for him to dismantle it and bring it to Paris, and voila, here we have Harry's New York bar in Paris. Hemingway was known to throw a few back here. People do come for their cocktails and they even have a published book with the drinks listed that you can use to order. Once I saw the spot, I knew what I had to have, and I knew they were going to get it just right. I have to say, it was the best dirty martini I've had in Paris. Finally! They also have a nice piano bar next door where we finished the night with some more good music.